Oak View Group co-founder Tim Leiweke is seeking to defer at least $80 million in state sales tax on the KeyArena remodel and an NHL practice facility at Northgate Mall and start repaying it in 2022. Similar deferrals were given in the construction of T-Mobile Park and CenturyLink Field. With costs climbing on the KeyArena renovation, members of the Los Angeles-based Oak View Group were in Olympia on Wednesday seeking to defer at least $80 million in sales tax payments related to that project and an NHL training facility. OVG co-founder Tim Leiweke, company executive vice-president Francesca Bodie and others were meeting with state representatives ahead of the putting forth of a bill later this week to delay the start of those tax repayments until January 2022. The bill, sponsored by House Majority Leader Pat Sullivan (D), is similar to tax deferrals previously given for the public-subsidized construction of T-Mobile Park and CenturyLink Field and Leiweke was quick to insist he isn’t asking for any debt relief for his all-private venture. Sullivan’s office did not immediately respond to a request for comment. If approved later this spring, the proposal would allow OVG to put off its current monthly sales tax repayment obligations until Jan. 1, 2022 — when the first of what would then become eight annual installments would be due. Those installments would include interest at a rate yet to be determined. By that point, the arena will have already had its spring 2021 reopening, a full Seattle Storm WNBA season and be partway through an inaugural NHL season set to begin in October 2021. “It’s not a subsidy,’’ Leiweke said. “The fact is, if you look at this project, it’s an even greater win-win. So, all of those that would ultimately claim that this is a break, or this is some sort of a deal, they’re wrong. Deferring the tax payments also allows OVG to reposition its financial books, removing the sales tax as a capital expenditure and including it as an operating expense once arena revenue starts rolling in. Nationally renowned sports economist Victor Matheson from College of the Holy Cross — a harsh critic of subsidies for stadium projects — mostly agreed the OVG move isn’t a typical sports subsidy. Matheson did say OVG should see a slight federal tax benefit by not including the state sales tax upfront as a capital expense. Capital expenses can only be deducted from OVG’s federal tax burden at a depreciated rate over several decades. By deferring the state sales taxes so it effectively becomes part of a future annual operating expense, Matheson said OVG will be able to claim bigger federal deductions much sooner. Originally estimated at $564 million two years ago in a winning renovation bid submitted to the City of Seattle by OVG, the cost of the arena remodel is now pegged at $800 million, along with an additional $50 million for a parking garage not originally in the group’s 2017 proposal. The estimated cost of a planned NHL training center at Northgate Mall has also now jumped to $80 million — up from $70 million when it was first announced last October. That leaves OVG on the hook for at least $930 million in infrastructure obligations. Last month, in an effort to contain escalating costs, OVG parted ways with the Skanska Hunt construction consortium and replaced it with Mortenson as the project’s general contractor. While OVG is estimating its sales tax payments will be at least $80 million, Leiweke said the total amount due “could be closer to $90 million” once all the bills come in. OVG on Feb. 15 is to deposit the total amount of the KeyArena and garage remodel less the estimated tax amount — meaning roughly $765 million — into an escrow account as per its deal with the city. Leiweke said the tax deferral request is merely the final stage of getting his group’s financing set before heavy construction begins. That mid-February date is when the bigger monthly tax costs on construction would start hitting the group. 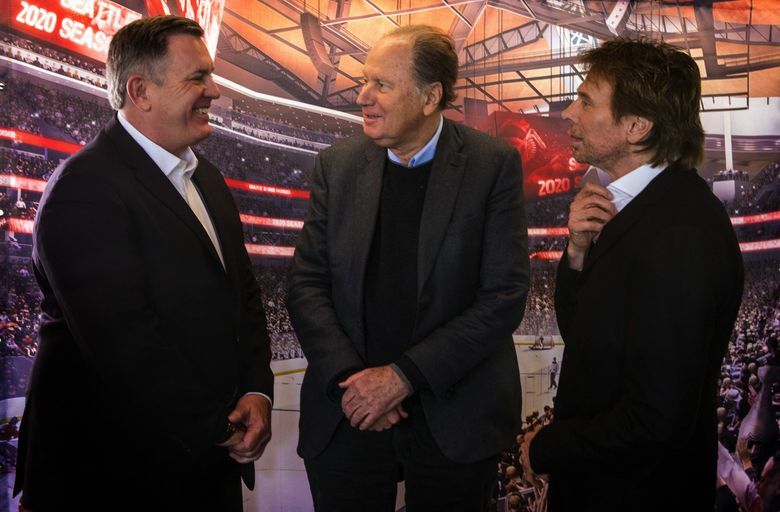 Leiweke said about $50 million of the project’s increase is related to “the cost of doing construction in Seattle’’ and that his company, its partners and NHL Seattle managing partner David Bonderman have agreed to cover it without taking on additional investors.